For help choosing the right diamond for you see our diamond buying guide. A sparkling 0.32ct round brilliant cut diamond is gracefully suspended at the top of an open ‘V’. Each shoulder contains 10 round brilliant cut diamonds, channel set, totalling 0.13ct. The ring is made from 18ct white gold and is highly polished for a mirror shine. 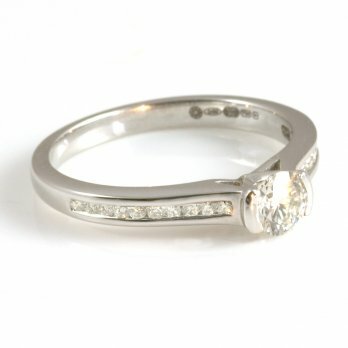 This elegant ring is a contemporary version of the more traditional design. A gorgeous item of sparkle and brilliance any woman would be lucky to wear!